Hi and welcome to the first of an occasional series, This weeks eats in which I highlight a few good things eaten in the past week. Well, let’s face it, food is one of the pleasures of life, and beg you all to read Ruby Tandoh’s Eat Up, to remind yourselves of just that. 1) Anyway, the featured image above is of earth gems (at least that is what they are called here in New Zealand). These little bright coloured nuggets originally come from South America I believe. They just need to be boiled as is – no need to peel – for about 10 minutes or so until cooked through. 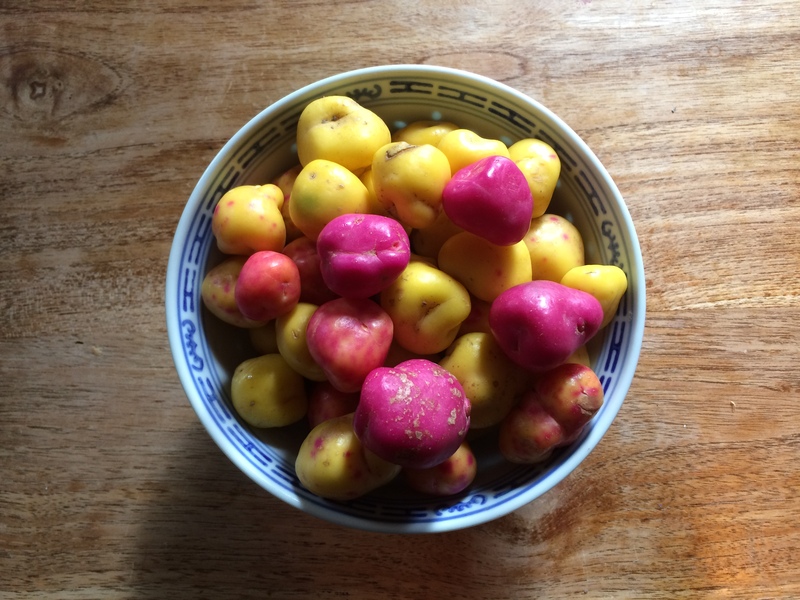 They taste a little like potato, a little like beetroot in that they are quite ‘earthy’, and best served with strong flavours, and tossed in good olive oil. I mixed mine with sun-dried tomatoes, some left over peas, Zany Zeus feta, oregano from the pot outside and olive oil from Blue Earth. I just added some baby spinach leaves for a complete meal (with leftovers for lunch the next day). 2) Wellington on a Plate (WOAP) is in full swing, and on Thursday we had dinner at one of our favourite places, Field and Green. It’s one of those places where the food is always delicious, the atmosphere relaxed and the service good. Their WOAP Dine menu started with potted salmon, dill and golden raisin scone with chive crème fraîche. The combination of flavours was sublime, the texture of the potted salmon just perfect and I could eat that dish again and again. We opted for the wine pairing which was a Ruru Pinot Gris 2017 from Central Otago. For the main dish, we both opted for the stuffed confit duck leg with Woody’s Farm pancetta, duck fat hasselback potato, Savoy cabbage and Ōtaki damson gravy. This was paired with Domaine Rewa Pinot Noir 2014, from Central Otago. This was just perfect eating – succulent meat, rich gravy, melting cabbage. If I had one slight criticism, I would have liked a more crisp hasselback potato, but you know, that is just my taste. For dessert, I had a scoop of ‘Cold Porter’ ice cream made with Kereru Brewing Wood Fired Toasted Coconut Porter, and Karl had the ‘Bucks Fizz’ sorbet made with Matahiwi Cuvee. A really excellent meal. 3) Yams – now I know I mention these fairly often, but these are such a winter favourite of mine. You just need to roast them for about 30 minutes, with some good olive oil and a bit of seasoning (and perhaps a drizzle of honey) at about 190C. Note that New Zealand yams are different from tropical yams. In the US, the vegetables known as ‘yams’ are in fact sweet potatoes similar to what we call kumara. 4) Finally, if you read just one food related article this week, read this one on obesity. We are eating less, but eating badly. So for example, potatoes have been demonised, not because they are bad for you, but so that people don’t think a portion of chips (fries or whatever you call them where you live…), is a portion of vegetables. Less potatoes are being eaten, but more crisps are being consumed. Do read it. Bon appetit! Smacznego! Smaklig måltid! Oh my goodness, I just ate breakfast but am somehow hungry again after reading this- soooo many yummy eats! Thank you for sharing! Oh I am going be looking forward to this weekly column :), and I never seen baby yams I wonder if I can find them at the farmers market ?!?! If that helps you to find them!